It would probably be better to make something Irish for St. Patrick’s Day. Corned beef and cabbage. Colcannon. Irish soda bread. But, if your tastes are like mine and tend toward the trashy, then grab a box of Lucky Charms and a sack of marshmallows. We’re making Lucky Charms Treats. Just melt a few tablespoons of butter, add your marshmallows, and stir in the cereal. I like to go half Lucky Charms, half Rice Krispies, since the Krispies keep the treats from getting too hard as they set. Also, if you stir in the Krispies first, the mixture has time to cool a little, so you don’t melt your pink hearts, blue moons and green clovers. Hourglasses? When did they start adding those? To take the whimsy completely to the edge, drizzle each treat with melted white chocolate, and add sprinkles. 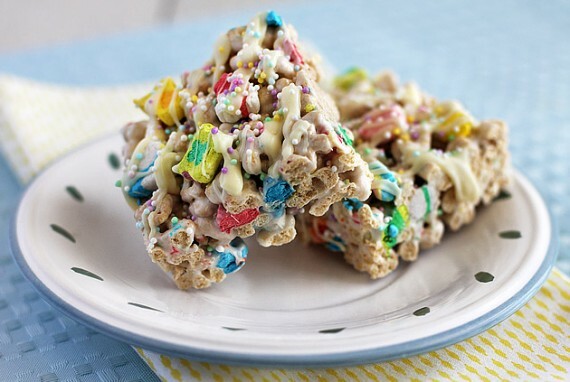 To get the best texture, I mix the Lucky Charms with Rice Krispies. The hollow Krispies provide some “give,” so the treats don’t get too hard over time. Grease a 9 x 13-inch baking dish with nonstick spray. Set aside. Melt butter over low to medium heat in a large saucepan. Add marshmallows, and stir until melted. Take the pan off the heat. Add Rice Krispies, and stir until well coated. Stir in the Lucky Charms. Using a spatula, transfer the cereal mixture to your prepared dish. Coat your hands with nonstick spray, and press down the mixture evenly. While the treats are still warm, add sprinkles, if using. Let the treats cool, and cut into 2-inch squares. Drizzle on melted white chocolate, if using. Store in an airtight container.